Now that our Little Garden Helpers are back at playgroup and nursery school the summer holidays seem an age away, but I still have one last week of garden bug activities to tell you about and this time it is worms; Long, thin, slimy ones, Short, fat, juicy ones and Itsy, bitsy, fuzzy wuzzy ones. By wiggling through the soil, worms create tunnels into which rainwater falls. These tunnels send water to plant roots. Worms don't just move soil out of their way as they tunnel but they actually eat it as they move along. Worms do not have teeth but small stones and fine grains of sand get lodged in a worms 'gizzard', the part of the body they use to chew. The stones and sand act like teeth, helping them to grind down the soil. Worms digest leaf and plant bits, which when digested come out of the back end in small pellets which also help plants grow. Worms also help plants grow by pushing dead leaves into the soil when they tunnel down from the surface. These leaves rot inside the soil and act as plant food. Worms also push seeds into the soil where they are more likely to grow into healthy plants. Worms can tie themselves into knots. Worms do not have legs. Instead they stretch forward as long as they can then pull in their tail ends to move along. Worms have no eyes or ears. Instead it feels vibrations. Like snails, worms dry out in the sunshine so they prefer the rain and hide in damp soil when the sun comes out. They also hide deep in the soil when the ground freezes. 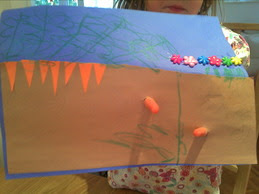 We made our very own worm by stuffing a leg from a pair of tights with cotton wool then adding eyes, nose and hairy bits. In hindsight we should have also added coloured tissue paper to brighten up the worm but they loved stuffing the tights with cotton wool. We made worm bookmarks using circles of shiny card. All our Little Garden Helpers had to do was glue them together and add faces. 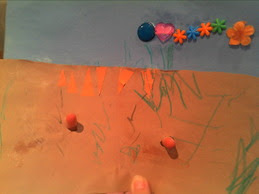 We created garden pictures with carrots and flowers growing in them and added holes for 'finger worms' to poke through. We had a lot of fun with these. We read 'William Worm' by Sheila Bird and Corinne Bittler, which all three of our Little Garden Helpers love, as well as Wiggling Worms at Work by Wendy Pfeffer and Diary of a Worm by Doreen Cronin which were great for teaching them about worms. 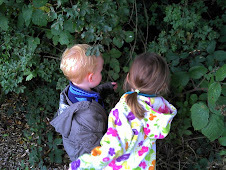 We looked in the garden for worms and watched them wriggle about. Garden Boy was even brave enough to touch one to feel for the rings on its body but Garden Girl was too squeamish to touch. We restarted our wormery and made endless trips to rescue escaped worms. We indulged Garden Boys desire to eat worms and made 'worm rice crispie cakes' by adding sour worms to chocolate covered rice crispies, which we pretended was the soil. We have all had loads of fun learning about garden creatures this summer so despite the holidays being over I am sure we will continue to learn about more as we come across them in the garden. Given my inability to distinguish a frog from a toad I am thinking that they should be next on our list! We used to have very poor soil here and finding a worm when we dig into the soil was such a rare sight to us. But after digging in lots of kitchen watse or garden leaves we now have many fat worm in the soil and such a joy looking at them. My kids are fascinated by worms - there are one or two facts on here I was not aware of, and will very happily look forward to imparting! Thank you. Just found this blog and LOVE IT, thank you. My children are nearly 2 and 4 and love gardening, but was *SO* in need of new ideas. Thanks! Fantastic activities. Might use some of those for DD, as at the moment she is scared of all little creatures, not good when down the allotment! !